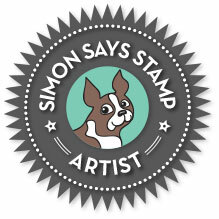 I love when Simon Says Stamp releases new products -- just love it. I was fortunate to receive one ahead of time and got to play with it to make this card -- the Dog and Cat Dress up set. Kitty in glasses! I mean come on! This set has a bunch of accessories you can add. I did a little bit of Copic marker coloring. And the patterned paper is from Altenew. The Ton is celebrating their first washi tape release with two new washi tapes! There are some free gifts with purchase promotions ongoing. Head over to The Ton Stamps' blog for more details. You should have arrived from the blog of the talented Laura Jane. These are gorgeous tapes and I loved playing with both of them. My favorite thing about these is that you can get a beautiful look without a lot of effort. To create this card I covered a piece of cardstock with Pink Peonies washi tape, matted it with a very thin mat of white cardstock, then rose gold foil cardstock (it's hard to tell in the photo but the tape has a metallic rose gold in it - gorgeous!). The banner and sentiment were created using the Basic Banners stamp and die sets. The top layer is white cardstock and the bottom layer is rose gold foil cardstock, slightly offset. They are popped off of the card with dimensional dots and a few sequins were added. Like the first card, I covered a piece of white cardstock with the Wildflowers Washi tape. I cut it down to be about 2/3 of the final card width. I found a striped patterned paper in my scrap drawer that I thought went perfectly. I adhered it to the card base and added the washi piece with fun foam behind it for dimension. I cut a thin strip of gold foil cardstock and adhered it to the left edge (once again you can't see in the photo that there is metallic gold on the tape). The greeting is from the Get It Girl stamp set and is heat embossed in gold embossing powder and matted with the same gold cardstock. Before adhering the greeting I tied a couple of bows with gold metallic thread and put them underneath. GIVEAWAYS: Win one of The Ton's new washi tapes! To enter, leave a comment on each blog. Effie will choose three winners and announce the winners on The Ton's blog by March 9. The comment period for this giveaway will close on March 8 at 7pm EST. Next stop on the blog hop? Head on over to see the inspiration from Kira Ness! It's Party Animals week at Honey Bee Stamps! Honey Bee Stamps animals are SO cute but they are even better when they party together! So I made a card with three partiers on it: Pinky The Pig, Mae the Mouse, Penny the Platypus. To create the background for this card I ink blended on white cardstock using the Honey Bee Polka Dot stencil set. I have used this so often! Then I stamped the animals and colored them with Copic Markers and used the coordinating dies to cut out the animals, accessories and balloons. The Hooray stamp set had the perfect word to add to the balloons for the greeting. You can save 15% on the purchase of any party animals by using the code PARTY15 on the Honey Bee Stamps website. Here is the link to all of the products that are eligible. Honey Bee Stamps is giving away a Paper Piecing Animal Dies on their blog and I have one to give away too! So comment here, on my Facebook post or on my Instagram post and I will draw a random winner.